Due to a poor grip (club more in palm of left hand as opposed to fingers), the left elbow starts to hinge as opposed to the wrist. As a result, the swing arc narrows and the backswing becomes too long. Instead of being in a powerful, coiled position at the top, the golfer is in a very weak hitting position; the left arm is bent and there is very little extension. If the arc of the swing is narrow at the top, the angle of attack into the ball is usually very steep and choppy. Contact is very inconsistent. Fairway woods are usually topped along the ground, while irons are hit fat, leaving behind very deep divots. Grip the club correctly, setting the club more in you fingers. This allows the left wrist to hinge correctly during the backswing. Halfway back, you should feel your left thumb pushing against the shaft. This keeps the left arm wide and extended as opposed to narrow and collapsed. And a bigger, wider arc means a much more powerful swing. When taking your grip, stretch the left thumb down the shaft. This puts more pressure on the shaft, helping push the club out away from the body and keeping the left arm extended. It makes the arm swing relatively short, but more importantly, very wide. This creates leverage and power. In an attempt to store more power for the downswing, the golfer overturns everything (shoulders, hips, knees) going back. Problem is, there’s no resistance at all in their right side. As a result, the right arm starts to move out away from the body, the right elbow elevates, and the clubhead crosses the line – or points well right of the target – at the top. By overturning and swinging too much around the body, the angle of attack back to the ball is usually in to out. As a result, the tendency is to hit a lot of quick hooks (clubface closed to the target line at impact) with the fairway woods and blocks (face square to the target line) with the irons. First, you must maintain some form of resistance in your right side (right knee flexed, weight on the inside of your right thigh) during the backswing. Second, you must understand how the right elbow rotates in the back swing. The elbow doesn’t lift. The right bicep should be parallel to the ground at the top, elbow pointing to the right hip. One way to stop the body from overturning is to lift your right heel off the ground about an inch, and make swings with the heel remaining up. This keeps pressure (your weight) on the inside of your right thigh as you turn back, so your right side can’t turn too deep. You should allow for some movement in your left hip as you swing the club back, but not so much that the hip turns well past the ball. Your hands and body are out of sequence coming down and, as a result, the wrists unhinge early and release the club well before impact. The path to the ball is still inside coming down, but your release point (when your wrists unhinge) is very erratic. This is different from swinging over the top, in which the path of your swing is out to in as soon as you start down from the top. By releasing early, the clubhead arrives to the ball before your hands. This produces a scooping motion at impact, effectively adding loft to the club and producing very high, weak shots – and often heavy contact. Or, the golfer reacts to the early throwing and straightening of the arms, and raises out of his posture (spine angle) during the downswing, leading to very inconsistent shots. Make a strong coil. The better your position at the top, the easier it is to synchronize the body and club coming down, and the less dependent you are on the hands to return the clubhead to the ball and square to the clubface. Work on creating a consistent tempo. In a good golf swing, the ball just gets in the way of the motion. The next time you’re out on the practice range, try hitting some balls out of your divots. By practicing off a bad lie, you learn how to hold the forward angle of the shaft through impact and squeeze the ball off the ground, creating a lower ball flight. 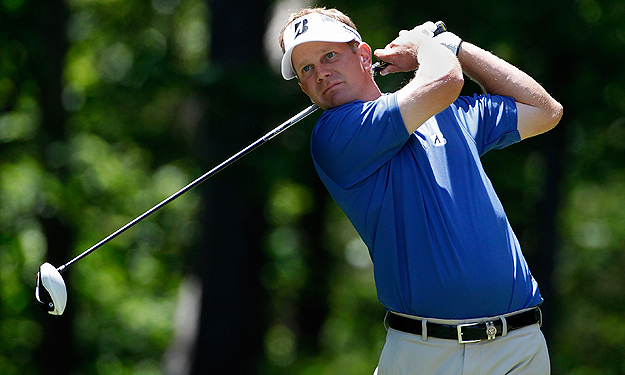 If you release the club too early, you’ll hit the shot fat and create an even larger divot. This is typically a better player’s fault. The lower body spins out so soon in the downswing that the hips are pointing left of the target prior to impact. As a result, the club gets stuck behind the body and the player is jammed through the hitting area, making it nearly impossible to release the club in time. Because your lower body is out ahead of the rest of your body at impact, you again depend on your hands to hit the ball and create power. This leads to very erratic distance control. You also lose the ability to shape your shots (to draw or fade the ball at will). Instead of building resistance in your right side, as you would when stopping yourself from overturning (see ‘CLUB CROSSES THE LINE‘), you want to establish a roadblock on your left side. At impact, your left side should be resisting, or bracing, for the hit; there should be very little give in it. You should strive to keep your legs very still, just as if you were hitting a fairway bunker shot. In order to release the club properly, your hips have to leave room for your arms to swing the club down in front of your body. If your hips spin out too soon, your right side inhibits this path. Here’s a simple drill to quiet your lower body. 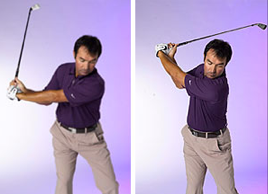 Start by setting the club in front of you in a post-impact position, with the handle just past your left hip. Then swing the club back and through, keeping the club in front of your chest. If you’re able to return the club to its starting position, your hips are staying quiet.